I have lived in Medway since 1996. I am a member of the Medway Finance Committee, and am also a volunteer with the Medway Senior Center. 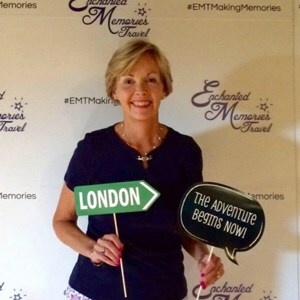 I am a Memory Maker® – independent Travel Advisor with Enchanted Memories Travel, LLC, 13 Main Street, Franklin, MA. We are an Authorized Disney Vacation Planner “Earmarked” Agency. We are also a top 500 Agency with Funjet, which includes United Vacations, Southwest Vacations, Travel Impressions, and dozens of other vendors; we also have relationships with all major cruise lines, and worldwide tour operators. I successfully completed all training courses from our preferred vendors. This is my full-time job; I do not do this on the side. We are a no fee, full-service agency. That means I work for you for free, and can give you the best travel planning advice for any vacation destination you are considering! Our agency is IATA and CLIA certified, is a member of the Travel Leaders Network consortium, and maintains insurance coverage. Our owners, Vincent and Maria Dowling, established the agency in 2012, and are members of the Downtown Partnership. Our company strongly believes that small businesses provide service with a personal touch that is very hard to find these days! I mostly work from my own home; however, I do sometimes cover shifts at the storefront. I have always loved planning trips, which is what led me into this field. I wanted to share my knowledge with people and to help them plan wonderful experiences which create lifelong memories. That’s what travel is all about. Once I started doing this as more than a hobby, however, I was surprised at just how much there is to learn! Today’s travel marketplace is varied and dynamic and requires constant diligence to ensure accuracy, follow best practices, and keep on top of changing rules. I participate in continuing education webinars on a weekly basis. I have concluded that using a travel agent is the right choice for today’s consumers to consider instead of wading through the glut of online consumer travel information all alone. Some agencies charge a planning fee or airline ticketing fees since vendor commissions are very small, however our agency will never charge any fees to our clients! I will be able to access unpublished airfares and as good or better pricing than you can find on your own for resort and hotel accommodations and transfers, and will act as your personal travel concierge to ensure you only have to pack your bags and start making memories! My goal is to help you select the perfect destination for your trip, make it as cost efficient as I can, and then take care of your trip like it was my own. I am available nearly 24/7 to answer questions, book excursions, dining reservations, and to always help with emergencies. If your destination is Walt Disney World, I will assist you in setting up your My Disney Experience account, and even get up early on the day you are eligible to make your dining or FastPass+ ride reservations for you, in addition to giving you the best advice on park touring plans. I love my job, and I want you to be the happiest client ever. I am very careful to keep my clients travel plans private as they are your plans, but I love referrals. If you are happy with my service, please consider telling others and sharing my contact information. You may fill out a Request a Quote form on our website and choosing Ellen Hillery as your Memory Maker, or we could have an initial consultation by email or telephone. Once we have found the perfect trip, I will ask you to complete our Book a Trip form (choose Ellen Hillery as your Memory Maker). On a secure site, you will share personal information I will need to book your trip and give me permission to use your credit card for your payments. I suggest you complete the form from a laptop or tablet as the site does not open well from some phones. You can even complete the form earlier if you wish. I will NEVER book anything until you are satisfied with the plans.Our insurance company requires the use of a form to help protect all of us from fraud. Then I will book your trip, forward you any confirmation information your vendor sends, and continue to work with you right up until you are ready to travel to ensure you will have the best trip EVER! Even after your trip is booked, I will still check on a regular basis to see if new discounts can be applied to your existing booking! I really appreciate this opportunity to serve you and to show my appreciation you will be receiving a personal thank you note after the booking occurs, and at some point, a small thank you gift. Examples of gifts I give include travel accessories, or gift cards from Disney, Dunkin Donuts, or Starbucks. After you fill out the Book a Trip form, I will begin working on your trip immediately. If you have questions about the process, please contact me – email, phone, text, or Facebook message anytime!